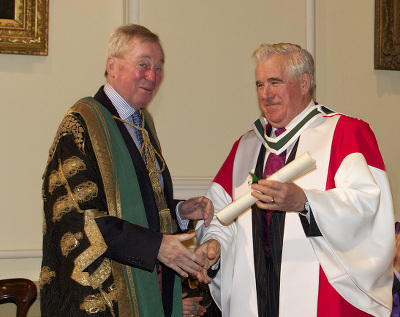 Expressing his deep regret at the death of Professor John Coolahan, the NUI Chancellor, Dr Maurice Manning said that Professor Coolahan ‘was one of a very small number of profound thinkers on Irish education. He has left his imprint on every stage of the Irish education system - early childhood, primary education, second-level, higher education and lifelong learning. His educational philosophy was rounded and balanced, informed by a deep humanity, a love of learning and a desire to encourage the full flowering of individual potential through education. His scholarly output was prodigious yet he was wholly unselfish in his public contribution to the formation of education policy. He was a much-loved and greatly valued member of the NUI Senate from 1997 to 2002 and until very recently continued actively and enthusiastially to support NUI in many of our projects and activities’.